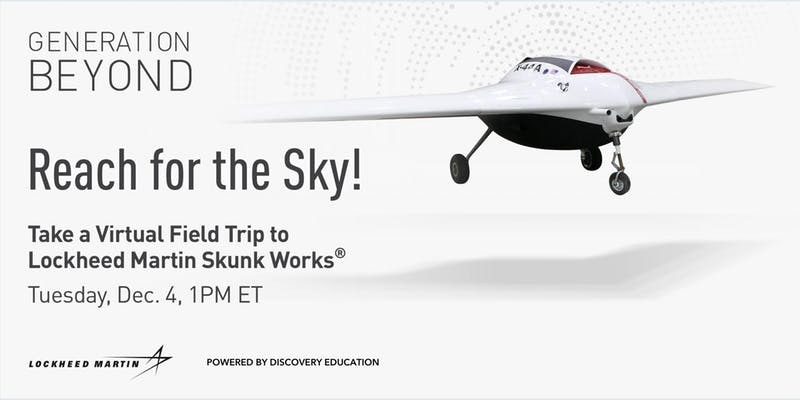 High school students with an interest in science, technology, math and engineering (STEM) are invited on a virtual field trip to Lockheed Martin’s top-secret Skunk Works® next month. Students will meet “skunks” who are pioneering innovative technologies that are changing the future of flight and get a behind-the-scenes look at the exciting work a STEM career can offer. The Lockheed Martin Virtual Field Trip: Think Like the Skunk Works® will premiere live from Palmdale, California on Tuesday, December 4, 2018 at 1:00 p.m. ET/10:00 a.m. PT. Educators, classrooms and communities can register for the virtual field trip at generationbeyondinschool.com. The virtual field trip is part of Lockheed Martin’s new digital STEM education curriculum, Generation Beyond: Aviation, which launched last month in partnership with Discovery Education to help inspire the next generation of STEM innovators. Learn more: https://aviation.generationbeyondinschool.com. Headquartered in Bethesda, Maryland, Lockheed Martin is a global security and aerospace company that employs approximately 100,000 people worldwide and is principally engaged in the research, design, development, manufacture, integration and sustainment of advanced technology systems, products and services. This year, the company received three Edison Awards for groundbreaking innovations in autonomy, satellite technology and directed energy. Learn more at www.lockheedmartin.com.